GooglePassers-by will be able to use their smartphones to interact with the Google ad on the new Times Square mega billboard. Here is the Google ad that is taking over the huge new billboard on New York City’s Times Square. From Monday, Nov. 25, Google becomes the inaugural advertiser on the screen, which runs nearly a length of a football field from 45th to 46th Street along Broadway, and is eight stories tall. The display is made up of 24 million pixels and it is the highest resolution LED screen of its size in the world. 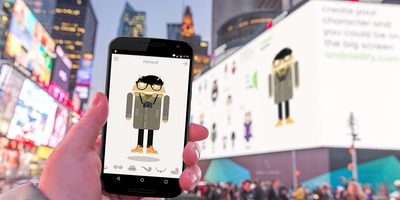 Passers-by will be able to use Google’s Androidify app on Android and iOS to create their own Android character to play with on the big screen using their smartphones from Monday afternoon through Tuesday. Those that can’t make it down to Times Square can still submit their character to appear on the big screen. If it appears on the billboard, Google will send you an email of the character on the billboard. Google is using the billboard to showcase its lead products, beginning with newly introduced Nexus handsets and tablets, through to Android Wear, Chrome and Maps. The company also plans to “gift” media space and time to six non-profit organisations and one Google-related cause project: Made with Code (internal to Google); Charity Water; WWF; Khan Academy; NRDC; Donors Choose and Give Directly. The cost of advertising on the billboard space, which is situated above the Marriott Marquis Hotel and operated by Clear Channel, has not been disclosed.